In his own words, David Martinez explains how film can be more liberating that digital. 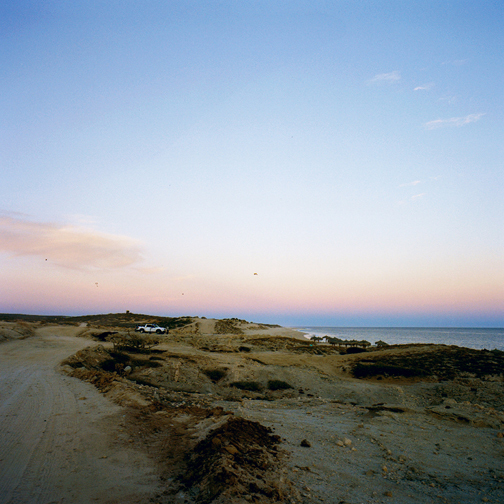 David Martinez recently shared with me that he was working on a personal project photographing landscapes at dusk. I know David’s work well and I knew that the imagery would be beautiful. I asked him when I would be able to see the images he laughed and said that it would be awhile. It had been a long time since anyone in our group had shot film, so I was even more intrigued. I asked David to write about it and here is what he had to say. “I like shooting landscapes at dusk. I see things that I normally wouldn’t in any other light and I wanted to explore that . I am just beginning the series, and plan to keep adding to it. 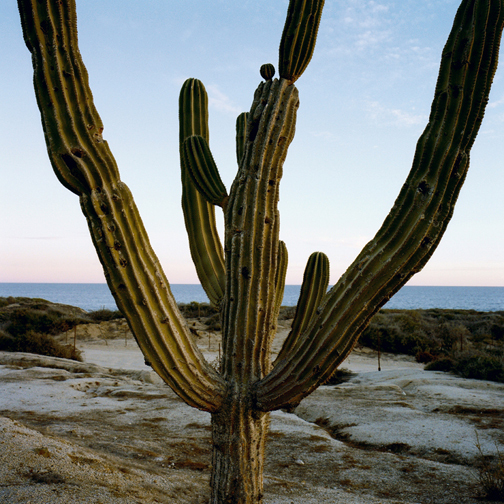 When I recently went out to capture some imagery for this series, I was in Mexico. There is a 5 mile stretch of beach that is slated for development in the next couple of years. It is one of my favorite places and I want to document it before it is gone. I have surfed this beach many a summer evening and really love the look of the light about an hour after sunset. I remembered images I had made with film and the robust colors and rich textures that it would capture. It made me question if digital could handle the subtle transitions of color. I knew film would be the way to go. I decided to shoot with my Mamiya 6 which hadn’t been used in 5 years. This is a wonderful camera. I love how the lens is beautifully warm and sharp. One of the greatest things about the camera is how simple it is. Initially I shot a few rolls of random things like my wife and daughter. I was getting reacquainted with film, so it was easy to just keep shooting. Oddly, it was liberating to shoot without the instant gratification of seeing what I had just shot. I kept going back to the location and over the course of a couple of weeks I had shot several rolls of film. 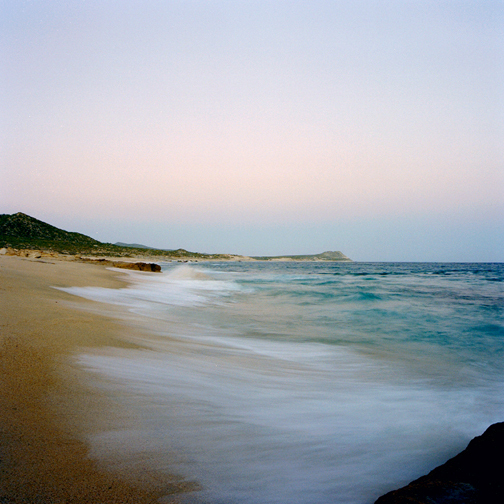 While I was in Mexico I was not anxious to get the film processed. However, when I got home I couldn’t wait to get to the lab. It of course took a few days to have it processed and proofed. So I just waited and wondered. When I finally saw that first image, I was surprised at the emotion it brought up in me. I was looking at an old friend, beautiful skin tones, smooth color transitions, and a subtle texture of grain. I hadn’t realized how much I missed film, but upon seeing it again I remembered just how beautiful it is. With each image I viewed, I became more impressed with the quality. I was reminded that the look of film, as well as the process of shooting the pictures, was very different. I no longer looked back and forth from the scene to the image on the back of the camera. I was just looking at what was in front of me and concentrating on creating a photograph. It was very liberating to trust my eye and have to wait and see what I created. Ironically, I was feeling more freedom shooting film than shooting digitally. It had been about 5 years since I shot film, but the look of it was so familiar to me. It was easy to see the appeal of it after not using it for so long. I know that the practicality of digital has made it the medium of choice but there is a beauty to film that can’t be replicated. I have become so excited about using film again that on a recent cover shoot for San Francisco Magazine, I shot film as well as digital. The art director preferred the look of the film version but due to an extremely tight deadline ended up not being able to use it. However, I was able to once again enjoy the freedom of film. This entry was posted in David Martinez, In Their Own Words, Landscape and Travel, Personal Work and tagged David Martinez, In Their Own Words, Landscape & Travel, Personal Work. Bookmark the permalink. Digital only gives you instant gratification if you want it. Turn off review and you don’t have to see your photos (well, thumbnails really) until how many hours, days, or weeks later. This is the kind of statement that makes the film vs. digital debate tiring. The same as comments like, with film you take fewer photos than digital, and they’re more deliberate. These things have nothing to do with the medium and everything to do with how the photographer uses it. Yes, digital allows you instant gratification and a spray and pray attitude. A Ferrari allows you to go 190mph, but you don’t have to get speeding tickets. It’s a choice. Use the tools that best help you make the photos you want to make. If you can’t help but check the LCD screen, then use film, but don’t blame that on the tool. Ranting aside, those are beautifully understated photos. Thank you for taking the time to read and reply to our post. You bring up good points about the difference between film and digital for sure. However, the idea of the article was merely to share an experience David had when he picked up a film camera after not doing so for a while. It was more about reminiscing. It by no means was meant to start a debate about the two. David knows that each is a powerful tool and will always choose the best tool for the job in his opinion. I feel the same way as David and I now shoot film on all personal projects. I know both digital & film are only tools used to create images, and a great image is a great image regardless of what it is shot on, however I feel the seeming limitations of film nurture a different mindset. And it is that mindset which makes me love shooting film. The cost, time it takes to process and the extra work each frame involves really focus’s the mind and it makes sure you ‘see’ each shot before you take it. There is no digital vs film debate anymore, digi is here to stay and will continue to be the commercial workhorse it is. I too have been feeling the yearning to shoot film… It’s such a different experience. And yes, while you can turn the screen off, you still have a completely different relationship to your tool and working practices shooting. To paraphrase David, with film you tend to trust your instincts more and just shoot; instead of shoot and check, shoot and check, shoot and worry and check. In recent years I’ve sold all but one of my film bodies and now I severely regret that. While I don’t realistically think there’s a commercial imperative for me to shoot film, for personal projects, like Wesley, I think I’m going to rejig the habit. Like so many, the magic of the darkroom is how I got hooked. And it’s time to feel that magic again. Thank you for your thoughtful post…..